Grief support groups can provide a much-needed bridge over the difficult days, weeks and months after a loss. Participants discover that the group is a place where understanding, encouragement and practical suggestions are readily found. Designed to meet different needs, all of our groups are open to anyone in the community who is coping with the loss of a loved one. Our groups typically meet on a rotating basis through the year. Contact Pathways of Hope at 937-258-4991 for the schedule. Growing Through Grief is open to any adult who has lost a loved one to death. This group is offered in eight week sessions throughout the year. 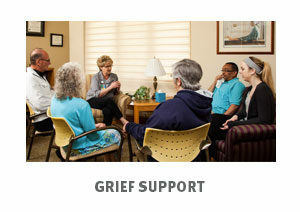 Growing Through Grief is held at the Dayton Hospice Campus in Pathways of Hope. Please contact a bereavement counseling staff member at 937-258-4991 for enrollment. Coffee Connection groups provide more informal support for bereaved adults, meeting monthly for an hour at locations in Springboro and Dayton. No registration is required. Call Pathways of Hope, 937-258-4991, for more information. Art Forever After group is a multi-generational art-based group providing the opportunity for children, teens, friends and family members of all ages to make art with each other. Located at the William & Dorothy Yeck Family Grief Counseling Art Center on the Ohio’s Hospice of Dayton campus, this group is offered weekly in three month segments twice a year. Call Pathways of Hope, 937-258-4991, for more information. Pathways of Hope serves all friends and family of any Ohio’s Hospice of Dayton patient, as well as the community, free of charge, thanks to the support of the community through the Ohio’s Hospice of Dayton Foundation.